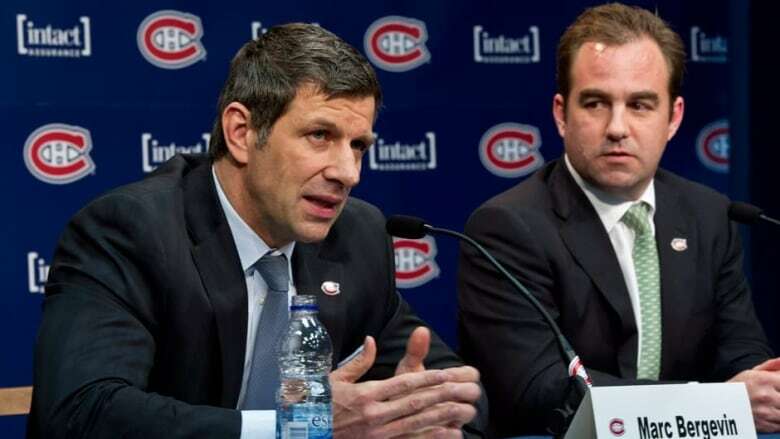 Montreal Canadiens owner Geoff Molson has given general manager Marc Bergevin a vote of confidence. 'I support him fully,' Habs owner Geoff Molson, right, says of general manager Marc Bergevin. Molson made the comments to reporters on Friday following the NHL board of governors meeting in Florida. Montreal (13-13-4) currently sits outside the playoffs in the Eastern Conference, two points back of the Boston Bruins for third in the Atlantic Division. The league announced Friday that the salary cap is projected to rise as high as US$82 million next season from the current $75 million, and Molson was asked if Bergevin remains the right man to use that money. "We've got some room on the cap, and you never know what he might do or might not do," said Molson. "He certainly does have the license to improve the team, and that's his job." The Canadiens tumbled down the standings when Carey Price missed 10 games with a lower-body injury, but rebounded with five straight wins after the star goalie returned to the lineup. Montreal has since dropped two in row, including Thursday's 3-2 overtime loss at home to the Calgary Flames.